Making something from a picture ain't easy. I could have sent you some bull frogs from the pond out back but it would take a forklift to lift them out of the water.....really cool bro. I've said this before and I'll say it again...if you gathered up all of your inventions and manifestions of ingenuity and brought them down here to an auction house, you would go home with a suitcase full of cash. Thanks but i could care less about money, if i have some and want something i`ll buy it. As far as selling all this junk it ain`t worth the effort if i die first Norma can sell it all. Money and greed is what got us into the mess we`re in now. Thanks Todd, are you up at the cabin?
. Thanks Todd, are you up at the cabin? No stuff happened, will see if it works to stick around for show next weekend. Been melting lead down into ingots for some people here. I dont have internet at cabin. But have plenty of wood to burn and critters to keep me entertained. Just got home from vet with Parker. All is well, just needed booster shots. She is almost 15 months old, 62 lbs and is about an inch taller at shoulder than her mother. Still a few more months of growing to do. I sure hope her hips & elbows are GOOD to EXCELLENT and no eye problems- can you say puppies?!?! Nice, i never scale anything just build as i go. I usually just tell people I make it up as I go. Was doing a trim job once, electrician on the job, homeowner comes in and starts racing about the work I was doing, I replied not bad for my first day, huh? The electrician though it was MY FIRST DAY ever doing trim... some people are gullible! I prefer finish type woodwork, probably cause I'm a machinist by trade. There is just nothing more beautiful than a nice piece of wood finished to enhance the grain. If it's got fancy walnut I'm all over it like ticks on a hound! We have a Birthday boy in camp today, bars open. Happy Birthday buddy, first ones on me. I agree 1000%. And it's a good thing I don't attempt it... I know all the "procedures" & tricks for doin' it... I just ain't any good at it! But, I can frame your house with flat walls, flat floors and square corners, (where they're supposed to be)... And that about as "finish" as I can do! Haha I hear you, Griff! We had a guy in town who did beautiful stock work for next to nothing. Just loved to work wood. And it's a good thing I don't attempt it... I know all the "procedures" & tricks for doin' it... I just ain't any good at it! But, I can frame your house with flat walls, flat floors and square corners, (where they're supposed to be)... And that about as "finish" as I can do! Ha! Me too! I have several "squares" around here and use them quite often. If a project has an angle on it, I redesign it to be 90 degrees. Yeah I've been known to shoot down retrieving dummies that get stuck in tree branches! Gee wizz OW Six still hasn't figured out what WE decided- hehehe! Hey hey hey there Gunny..........you guys taking advantage of me while I'm sleeping? Just because I got to bed at 2 something and got up at 11 something don't make me any less of a person. What's going on? Whew, mom made the best pork roast with different colored carrots and these little potatoes, when I went to sleep I slept like l did the time Jay was in my safe. All I'm saying is look at his bday post... unk! I had a recipe for a pork roast from a Jack Daniel's cookbook, first time I made it it was absolutely mouth watering good. Next time I made it not good at all.... no idea what went wrong! The first round went way low so had to raise the sight a few clicks, shot at the center dot first clip shooting right a little but don`t think it does with hard ball so i`ll leave it. Fingers were getting cold on the second clip so not as good of group, you can fill in everyone on the bullet and load. Looks like ole Six has a pretty good M1 load worked out. Yeah, shooting in the cold is a whole different proposition. I find it is a great equipment test though. If it will run in the cold, it will run anywhere. 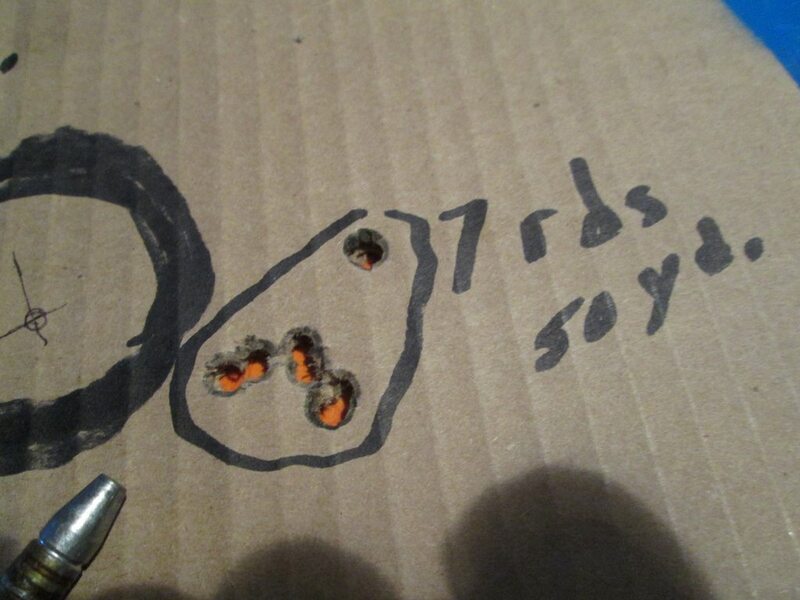 Thanks Jay, i put that second dot half in the blue and from 50 yards i could only see half of it which made a slim target too stupid to turn the target over seeing it was shootin right. Those shells would be neat in a single shot rifle. Your welcome Lenn....I have plenty more here. Did you have to work the action by hand? Hey Lenn...when you get a chance, take a picture of your outside woodstove...the wife wants to see what it looks like. We were just looking at the weather for your town and she says, "how in the f does he deal with that?"----6. She is too warm blooded. Don`t know what most that reply is about but yep had to work the action by hand but can put a full clip in the gun so works pretty good. I`ll look and see if i have a pic of the stove if not i`ll take one. The stove is forced air but they burn a lot of wood if its cold. This stove has two 10 inch pipes from the house, it takes air from the house and circulates it through the stove (jacketed) and blows it back in the house. Its thermostatic controlled and it stays the same temp all winter. Six was talking about Gunny and I inheriting his stuff. He had made a remark about me being his son. So.....I just figured I'd take advantage. Whoops sorry i`m a little slow catching on sometimes. The way this winter is going so far we might even have some wood left over. Haha no worries bud. I'm always behind about 4 steps! Just so long as we aren't late for dinner!! Dont worry Six your wonderful lovely wife would be taken care of, OW and I are just getting your JUNK. Pitchy it looks like that load is about perfect! Good ol Six sure knows his stuff!! I just realized I didnt take any pics of the A5 after I reblued it! Since I dont have salt blueing I use the 'Belgian ' technique. In my opinion the Belgian gives a much darker blue which is more appealing to me. Took this pic today. If I'm not picking up the dog hair tumbleweeds im washing the 'nose art' off the doors! Haha! We get those "tumbleweeds" too. I find em turning circles on the floor from the ceiling fan. First time I have ever recovered a slug from a deer. 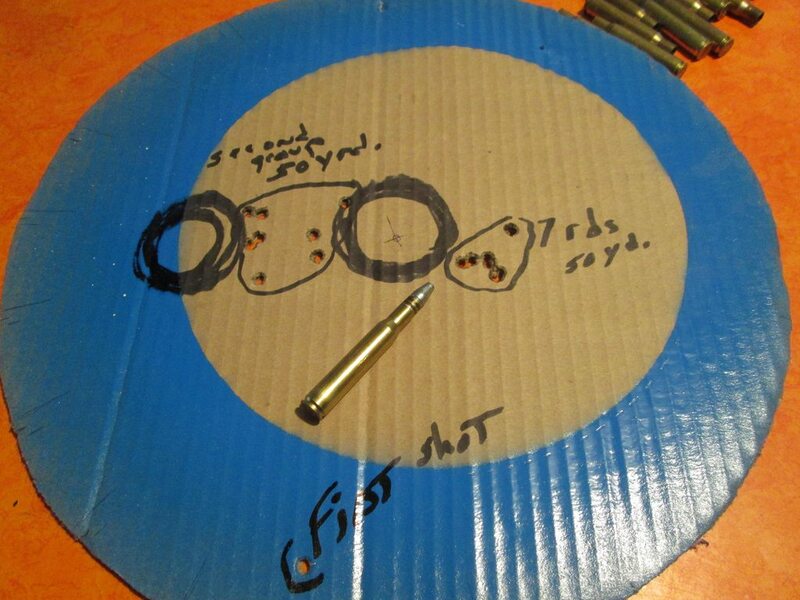 I'm shooting Remington 3" 20 ga accutips, 260 grains. While skinning the buck I shot the other day the slug fell on the floor. To my surprise it weighs 258.1 grains- talk about weight retention! I have found muzzle loader bullets, round balls and buckshot but never a slug. This slug went through the off side leg bone too. I'm impressed. Did you drink the JD 1st, and then eat the pork roast? No Todd, the booze went into the pork tho I was in the beer! Gunny where`s that pic of your A5? I dont have it yet, I glued it for a friend, asked him to send me pics but haven't seen then yet, he is waiting for the truoil to dry on the wood. This gun was used- a LOT! Checkering on the wrist worn mostly off, the receiver had so much GUNK in it I'm really surprised it functioned! Well, Your bud had better hope the barrels are straight....3 legged Turtleman has em now! Yeah Jack I hear ya! This gun was bought on an auction site, came from a pawn shop in AZ. The blueing was very thin, finish on the wood was worn off. Has a 28" modified pipe. Its actually his wife's gun and she shoots it well. I sure hope those pipes you sent Todd are straight!! Wahooo, just got a email saying the new Garand will be here tomorrow. I know you been worried. Thanks buddy, i`ll be posting pics for sure. Hey Pitchy that's GREAT FANTASTIC SUPER NEWS! Sure hope it has beautiful wood! Thanks! 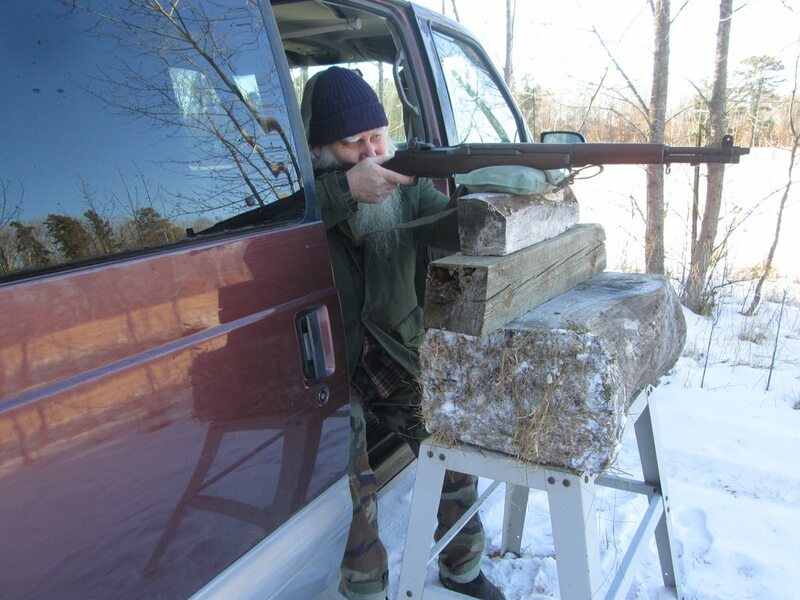 Amazing what a little color does- this old shotgun was well used that's for sure!